Suprageography | A blog by Oliver O'Brien, researcher at UCL Department of Geography. 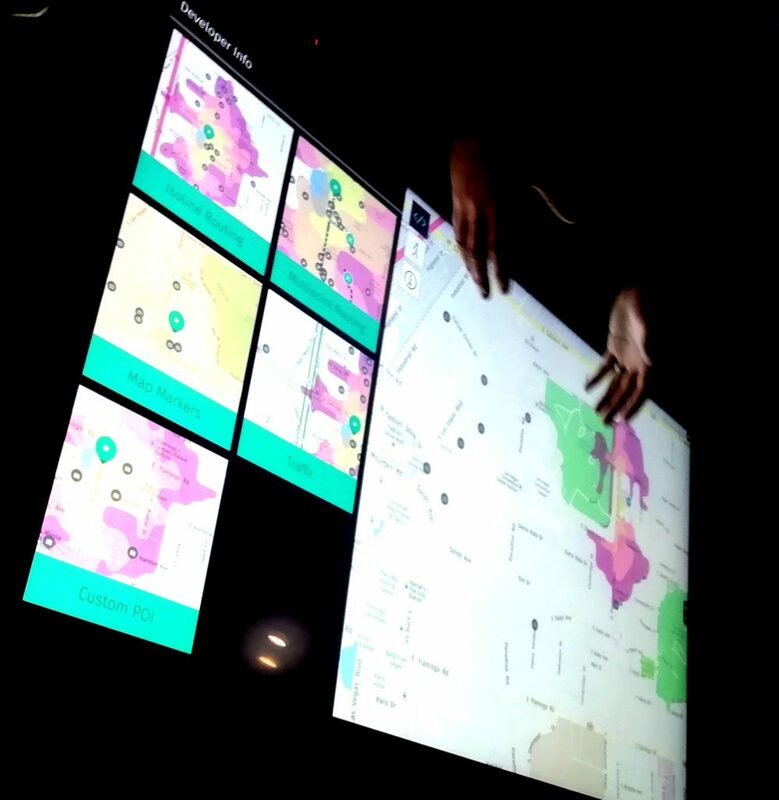 Digital cartography, data visualisation. 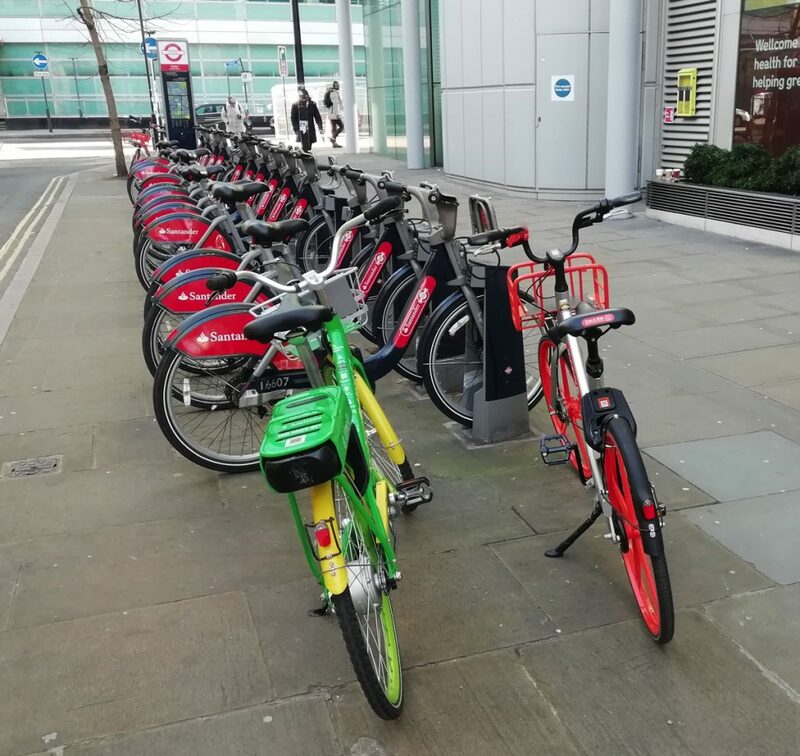 The Guardian newspaper has published an online article about the rise and fall of dockless bikeshare, focusing on the pure dockless systems in England (there aren’t any in the rest of the UK) that grew in 2017, and then shrank last autumn. 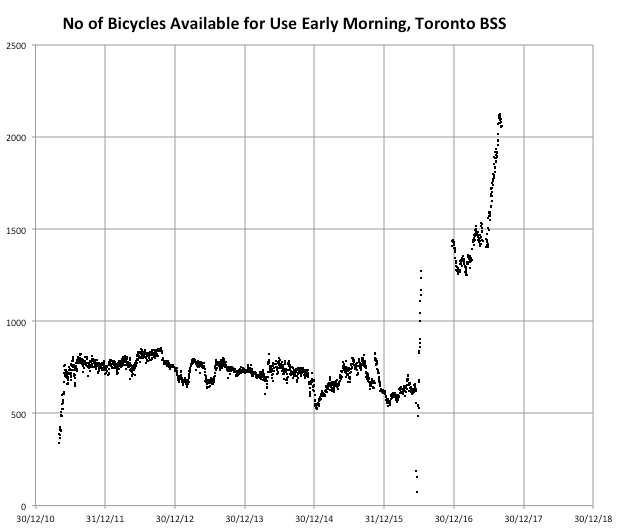 The article extensively used some of the geospatial boundary data that I have – you can can see this on Bike Share Map. It also used some estimated counts and also looked ahead. Mobike, after their summer expansion and autumn radical contraction, appear to have got things under control and have started expanding again. 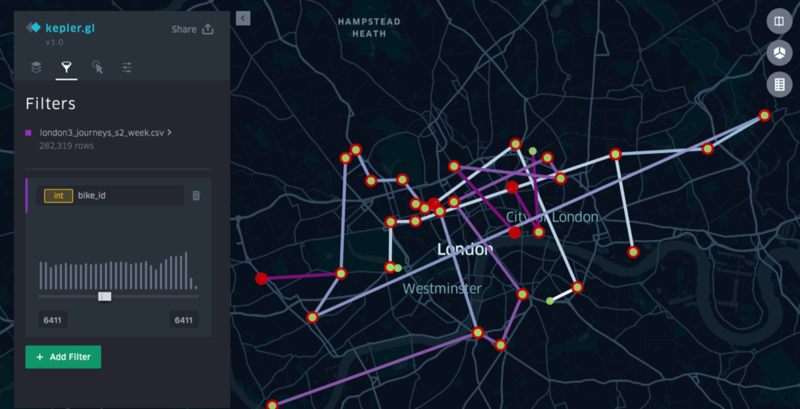 They remain operating in two main areas – in west London (around Ealing, Acton & Chiswick) where they are not competing with Santander Cycles, and in central London (Camden Town, Bloomsbury, Angel, Bankside and the City of London) where they do. They are keeping their operating areas small, and their densities high, and are staying out of the inner city London areas where they will have had great numbers of their bikes stolen and vandalised. This is an eminently sensible business decision even if it restricts the usefulness of the system in a broader London context. Their fleet is largely upgraded to the Lite model which is much more comfortable to ride. No sign of any pedelec (electric assist) yet. They still have a very high out-of-zone charge, which coupled with their often changing operating boundaries means that users need to do some research before hiring, to avoid unexpected penalties. This lessens the scan-and-go readiness of the systems. There are around 1800 in the fleet currently. 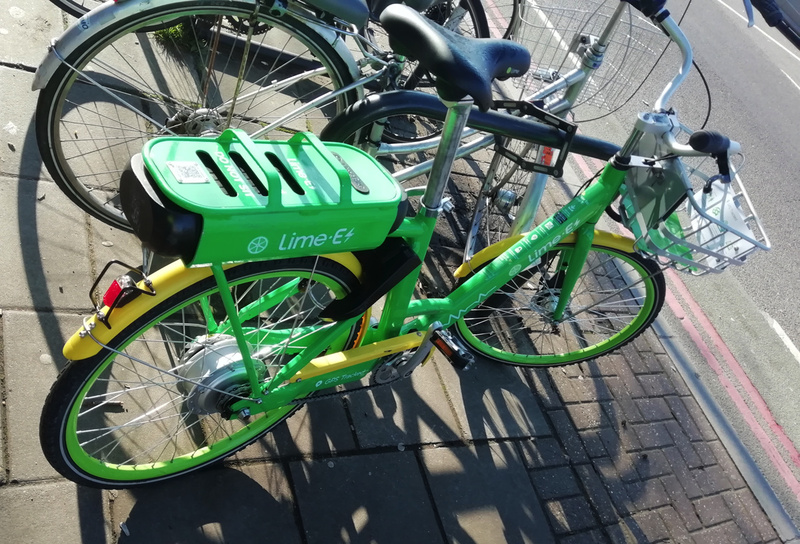 Lime‘s pedelec system was looking good, with a carefully run system with no penalties for starting/finishing out-of-zone (as long as you don’t go out of London itself). Although I found the actual cycling experience not amazing, I am probably not the target market, and right now it is making a positive contribution to London’s Mobility as a Service (MaaS) options. However… Lime in the US have had a change of policy recently, switching all their pedelecs to escootershare. 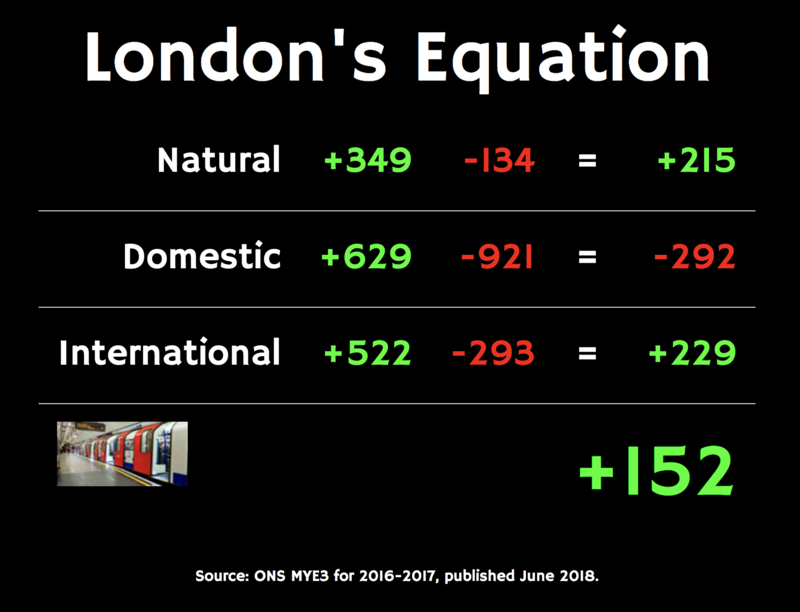 This doesn’t bode well for London in the long term, as the large MaaS companies are all about economy of scale. Maybe London will be quickly and genuinely profitable for them, and they’ll keep running the system here. We shall see. They currently have around 1400 bikes in their fleet in London. Beryl’s Secret Cycles pedelecs remain in active pre-launch development. They are being developed right here in London and the group are taking time to get it right. The odd Secret Cycle is occasionally seen on the streets of London, and a council test is taking place in Enfield. It looks like they will, after launching in Bournemouth, be bringing their system to Islington, Hackney, Tower Hamlets, and presumably also Enfield. There are currently around 10 in their fleet, none for public use. Freebike pedelecs are currently being tested by Waltham Forest council employees, so it may be launching there at some point soon. However, a City of London decision suggests they may also be coming to the heart of the capital too. This is a small place so having all the various operators in here could be interesting. However, half a million people do commute into the so-called Square Mile every working day, so there is always going to be a big focus here. There are currently around 10 in their fleet, none for public use. JUMP pedelecs are also likely coming. Their parent, Uber, had a job posting out for a London-based operations/field manager. With Lime’s US pedelec retreat, JUMP are the sole US-based pedelec system and are increasingly finding they are the only bidders for US city dockless systems. London’s competition will be harder, thanks in no small part to escootershare remaining illegal here. JUMP will likely go big when they launch. They will also be able to leverage their huge existing base of London Uber users – no separate app needed! Finally, and this is pure speculation on my part, but YoBike runs some reasonably successful systems in Bristol and Southampton. The platform that YoBike is part of is SharingOS, and they are based in London. I am sure they would to have a physical system a little closer to their base. If there are going to be 5+ systems in central London, then the authorities are really going to have to get their act together re managing parking for these fleets. A mass expansion of cycle parking hoops, or taping rectangles on pavements for them, is going to be needed. 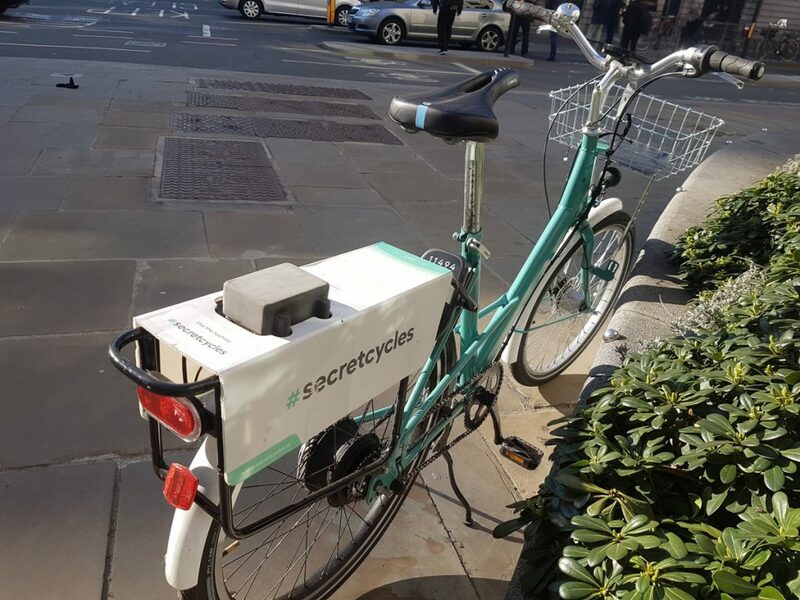 A Beryl Secret Cycle on test, spotted in the City of London. Photo courtesy of Angus Hewlett. Surprise mobility option, sitting at a bike stand in North-East London. 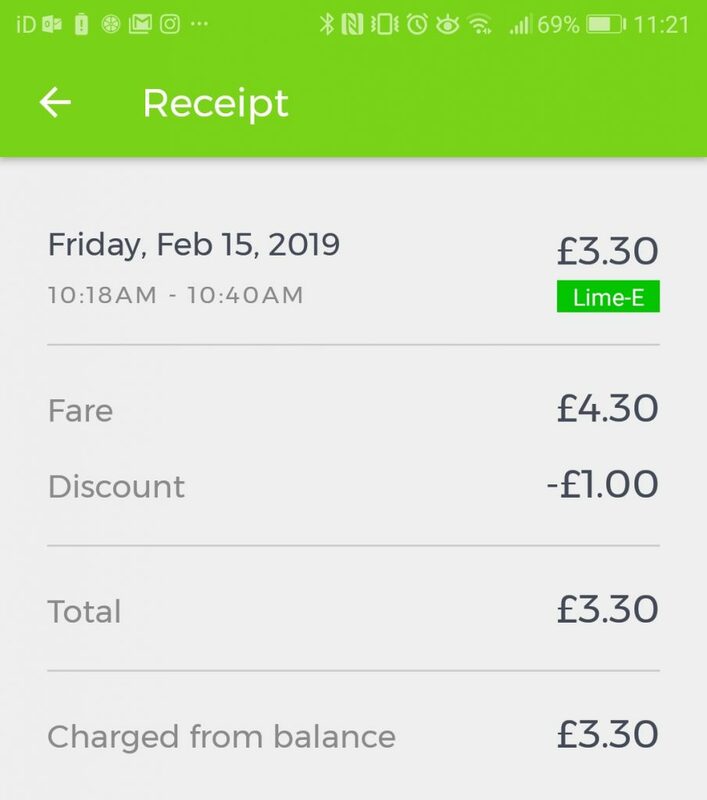 I hadn’t tried Lime so far, although it launched last December – I was put off by the £1/hire+15p/minute cost – that adds up quickly. But, I needed to get to work and it was right there. Surely this bike could prove to be an effective alternative mode of transport, for my immediate commute requirement? I already had the app installed on my Huawei smartphone, but had not put in payment details – only when trying to scan did it prompt for a payment card. Android Pay stepped in to automatically add my credit card details, however Lime didn’t like the two-digit year supplied by Android, requiring a reenter of that section. My ride. Looks good on the app and in real life. Then, a rescan and the bike unlocked with a click in a couple of seconds. (Interestingly, the wheel-lock was quite a small one, not the chunky ones that appear on Mobikes now to try and stop rampant theft of them.) Something (the bike, battery or the app – not sure!) played a jolly tune to indicated success, and I was off. Unfortunately I quickly noticed the bike loudly jolted with each wheel turn – possibly a buckled spoke or other problem with the wheel – it was not enough for me to abandon the journey, but was not something I would leave before fixing. Later on, something else made a plastic rattling noise at the back of the bike every time I pedalled. 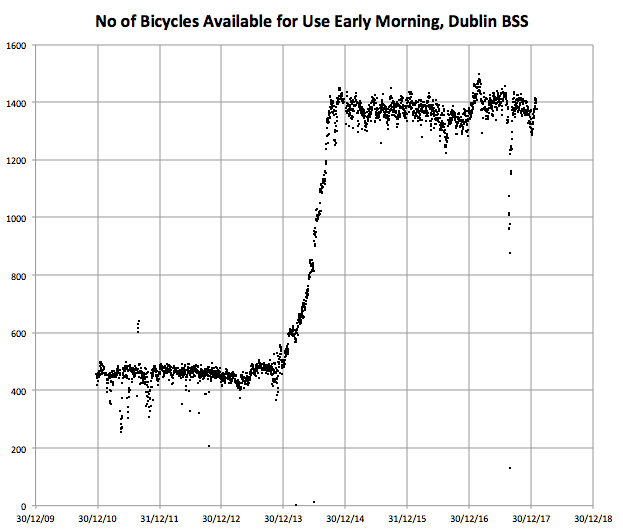 Maintenance (or lack of it) was a problem with the non-electric dockless bikeshares in London. I was hoping that the more expensive electric bikes would have a more rigorous repair regime. Maybe they do and I was just unlucky. The initial acceleration boost given by the battery was great – straight across the lights and down to Finsbury Park. However, almost immediately it just felt like a regular bike – there was still a boost at faster speeds, but it felt like it was just countering the heavy battery, rather than genuinely making it easier than a regular bike. I didn’t feel slower than my regular bike – but it didn’t feel like it was any less effort either. There is only one gear, so the only thing you can do other than pedal, is to ring the handlebar bell. The gearing is OK – it’s certainly better than the Mobike/Ofo/Urbo ultra-cautious setting. I was keen to measure the “configuration” for the electric-assist, so stopped after around 3km, at the bottom of the main remaining uphill on the route – up Camden Road past the old Holloway Prison – to attach my Beeline smart compass – not for its primary navigation purpose, but to get an idea of the speed I was travelling at. The speedometer function has rather nice analogue-style needle, and was a useful way to see my speed without looking at my phone, even if it is based on my phone’s GPS and therefore lags by a few seconds. Beeline smart compass on a Lime bike – testing the electric assist at different speeds. It was undoubtably nice to accelerate up the hill with the battery doing the initial work. It seems that, between 0km/h and around 12km/h, the battery does most of the work. From around 12km/h to 20km/h (my normal peddling speed) it gives a slight assist – not really noticeable but presumably useful for longer journeys. From 20km/h to the legal maximum 25km/h I’m not convinced the battery was helping at all – or if it was, it was just partly countering the weight. It was hard to pedal the bike above 25km/h even downhill on a clear road – but that’s presumably by design – bikeshare is generally meant for quieter roads and less experienced users, where a slower speed is safer, rather than me trying to match the vehicular traffic on a sometimes busy “red route” major road. However, it would be nice to have a much bigger boost between 12km/h and 20km/h, so that you only have to be doing significant peddling work at the top of the range. I feel more tired out than I would have on my own normal pretty cheap road bike. It took me 22 minutes to get in – exactly the same amount of time as my own bike would have. Average speed 19km/h according to my smartwatch – pretty standard for me. Certainly my fastest journey on a bikeshare bike in London. Journey’s end, at the Santander Cycles rack near UCL. Note also the Mobike. My fare. This is expensive for a Zone 2-1 journey in London. A bit of bill shock though – £4.30, as it was a 22 minute journey (£1 hire + 15p/minute for 22 minutes.) The £1 was, at least, waived as this was my first ride and I was on a referral (btw use my referral code RVDG4MS if you want your own). The pricing structure means that the temptation to (safely) jump red lights was strong – much more so than on my own bike. There are a lot of traffic lights on the route and everytime I hit red on one of the bigger junctions, it will have cost me 15 pence. That’s, unfortunately, a pretty powerful financial incentive to break the law. I didn’t (obvs) – but I can sympathise somewhat with the Uber Eats and Deliveroo cyclists who are numerous in London but aren’t the greatest at obeying the rules… for them, like the many delivery vans in central London getting tickets for illegal parking, the speed/penalty balance is tilted towards bad behaviour. Journey of 2.5km according to Lime app – the “finish point” being where I paused to put on my speedometer and switched to another app in the foreground. 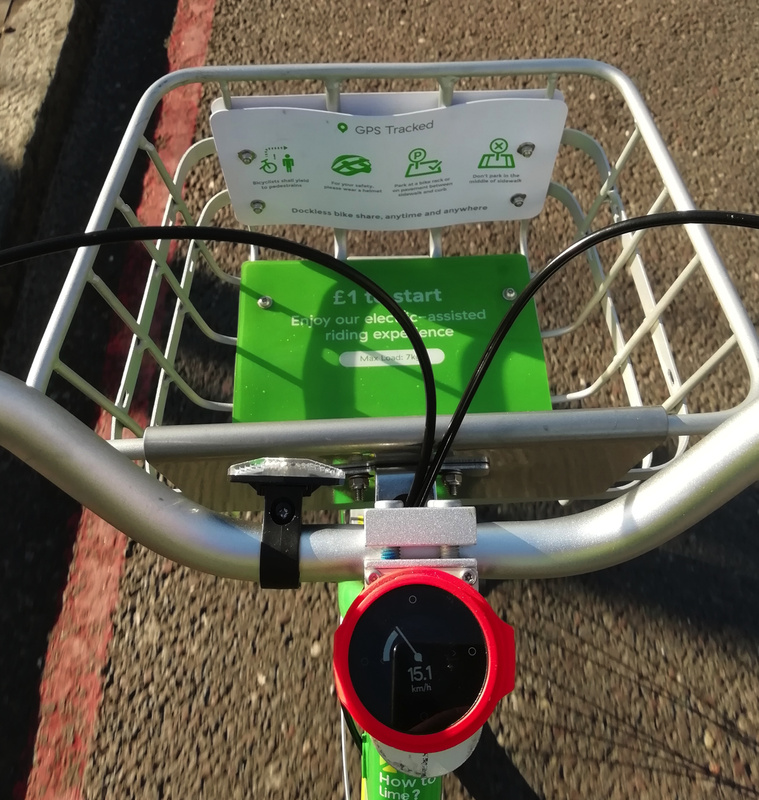 Actual journey on the Lime bike – 7km. This issue may be a Huawei/Android 6.0 thing – it could be because the Lime app doesn’t have permissions to access the GPS in the background – or Huawei’s battery “optimisation” cuts off its connection in the background anyway – this has already caused me problems – but it should have been clear to the app that if it wasn’t getting GPS information from my phone, it should be using the bike’s – so I don’t think the bike has any, or it’s not used. 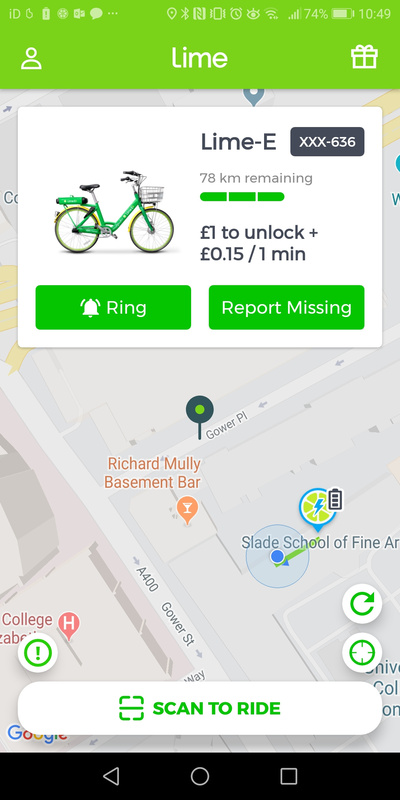 This might be quite tricky to someone trying to find the bike – they’d need to head out of UCL, along Gower Street, and then up Gower Place to find it. 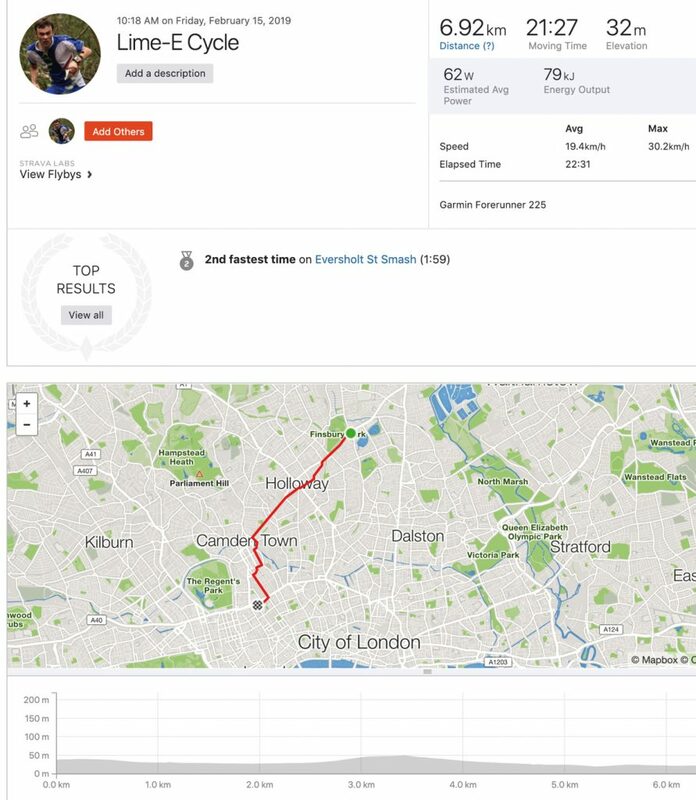 It looks like Lime again used my phone GPS as soon as it could – well after the ride finish – so has recorded the wrong location. It may be that it will later use any SIM card on the bike to triangulate its location correctly (or even its GPS if it has it – I suspect not) and snap back to Gower Place. But, this kind of asset tracking trouble is a nightmare both for users (they can’t find the bike) and the operators (they can’t find it either!). 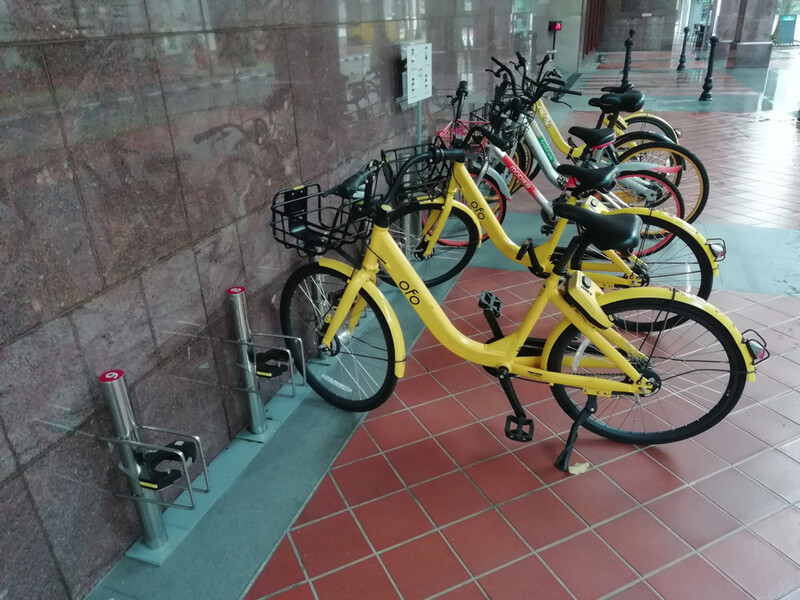 This is one of the reasons Ofo essentially failed – they couldn’t find their own bikes but with the higher costs of electric bikes, I’m really suprised to see it again. In mitigation – there are very tall buildings here and the street is narrow – so it could be a simple GPS error too. Indeed, as well as the “lime symbol” (bike location) being wrong, the blue dot (my location) is also wrong – I’m standing at the “crosshairs” symbol on the map above when I took this screenshot. 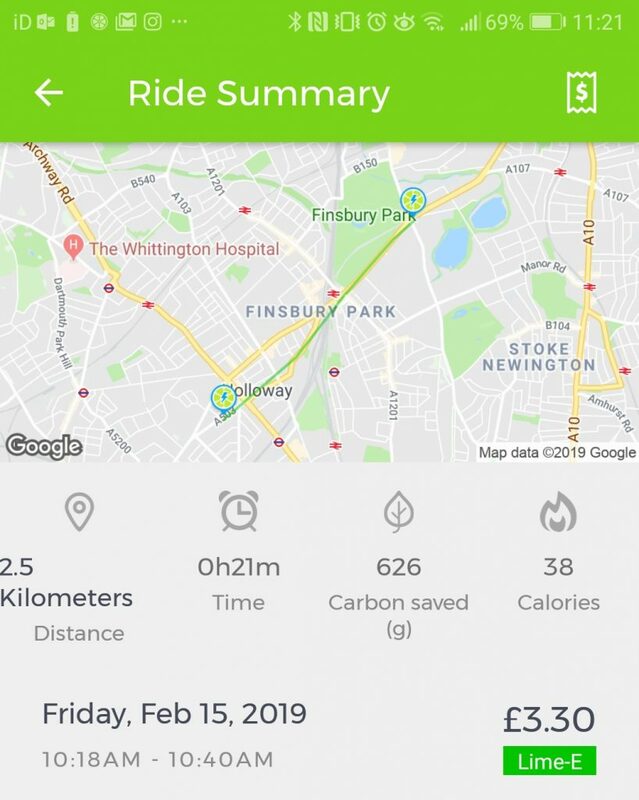 So, to conclude, getting a Lime-E to work didn’t work out for me – it cost more than the tube, and took longer, and still required a lot of pedalling. However, I’m not the target user I suspect – it’s people who wouldn’t be cycling anyway, and just want an easy way to get around, not in a great rush, and maybe with a little bit of exercise but nothing too strenuous. I don’t think most parts of London have enough hills, to make the relatively high cost of Lime worth it here – although I would love to try it out on Swains Lane. Maybe a user-configurable app option could change the profile on the bike, to allow a decent boost between 20-25km/h. I think electric bikeshare has a place in London. We aren’t quite there with Lime. They are doing a lot of things right – not overwhelming the streets, looking after their fleet fairly well (I never see them knocked over) and allowing sensible usage anywhere – but they are also making some of the mistakes which the older dockless companies (Ofo/Urbo/Mobike) also made in London. They are also, like almost all the other companies in the space here, not sharing their bike locations publicly/openly. You either have to open the specific app for the operator, or happen to see a bike when you weren’t expecting it (like me today). If Google Maps, Transit or CityMapper had told me of these, then surely they would be used more and more effectively. 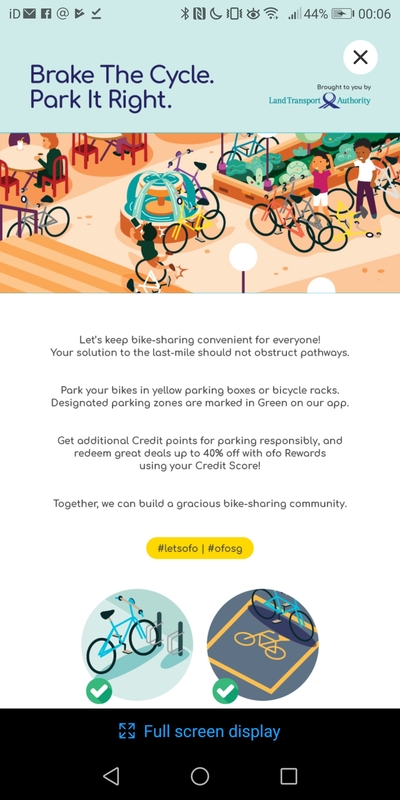 Get your GBFS feeds out there, bikeshare companies, regardless of if you are mandated to (big American cities) or not, and let people find your fleet in new and better ways! I’m not quite convinced we have arrived at the future of smart Mobility as a Service (MAAS) just yet, at least in London, but at least there are various companies working on it. It’s going to be an interesting summer. The HERE Technologies booth at CES 2019. 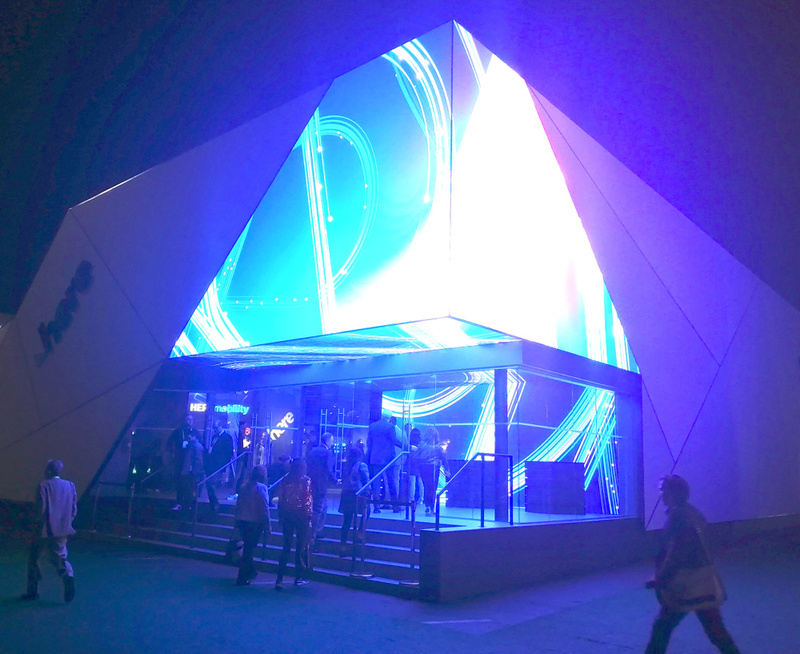 I was a guest earlier this week at HERE Techologies at the Consumer Electronics Show (CES) 2019 in Las Vegas, the world’s biggest consumer electronics trade show. Their booth was directly right outside the main entrance to the Convention Centre, the hub of CES, right beside Google’s own huge one. The juxtaposition was interesting, the two companies competing intensely in some areas of location services (e.g. mapping APIs, journey routing and rich global POI databases) while being distinctly different in their approach – Google being very consumer focused with its ubiquitous brand, its location tools being largely smartphone based and advertising/user profile driven while HERE’s European origins are reflected in its strict user anonymisation defaults, its main datasource being car sensor information from cars (e.g. some of the major car companies are the key investors in HERE), and its mainly B2B focus which means that the UI you typically in front of HERE’s location intelligence is typically branded from the car company itself. The car sensor information drives much of the 5 million updates made every day (generally automatically) to its global master map and also means that HERE has a pretty good live traffic data stream of its own. The global master map also contains 160 million+ POIs (points of interest) – it’s a seriously large database – which HERE has collected, collated and bought from a wide variety of sources. The map is a core part of HERE’s overall location platform offering. HERE’s booth was a hive of activity, with product demos downstairs (themed around “the new reality”) and a small stage, while upstairs, numerous meeting rooms were full all day, presumably with various meetings between HERE executives and at a guess, car companies looking for platforms to power their car/user information systems, city transportation agencies looking for new datasets to understand their city roads more effectively, and other key potential stakeholders in HERE’s location platforms. The the breakout areas were also well used and even a little outdoor cafe/terrace overlooking the main entrance to the convention centre. The HERE XYZ developer API. Our group was introduced to a number of people at HERE, including the CEO and various product managers. 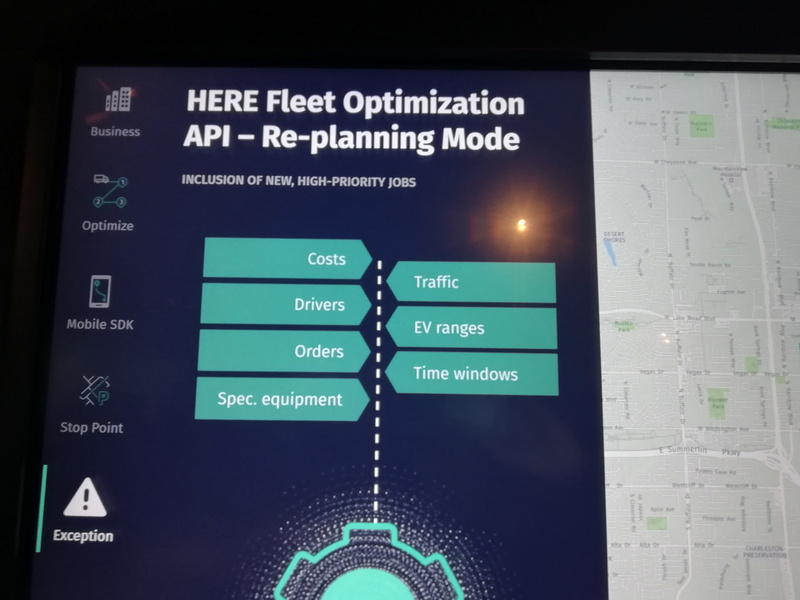 Of particular interest to me were the Fleet and Developer API talks – the former because of the “enterprise level” travelling-salesman-problem type (actually the vehicle-routing-with-prizes problem) functionality that is a core part of the platform, and the latter because I’ve already used a little bit of the HERE mapping APIs. 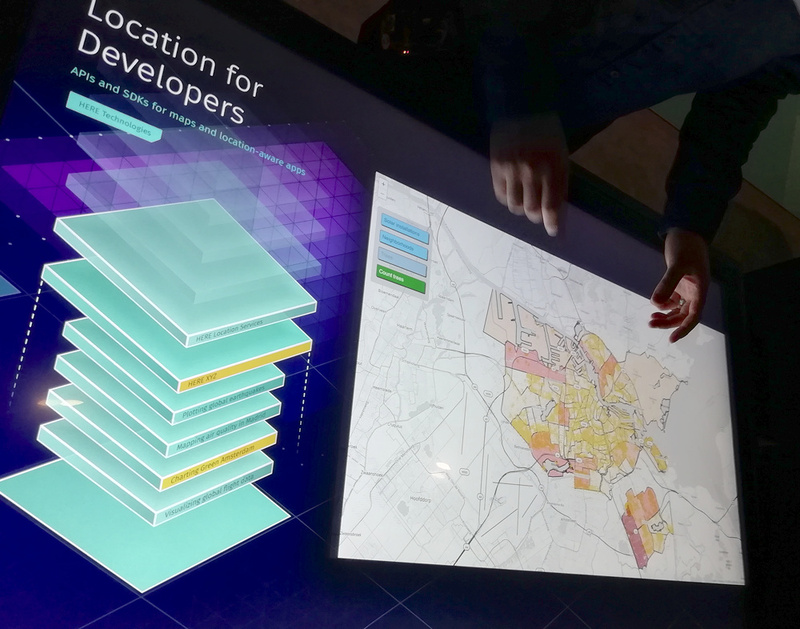 I also chatted to the HERE Mobility team who also had a presence in the HERE booth and also their own display in the main exhibition halls. 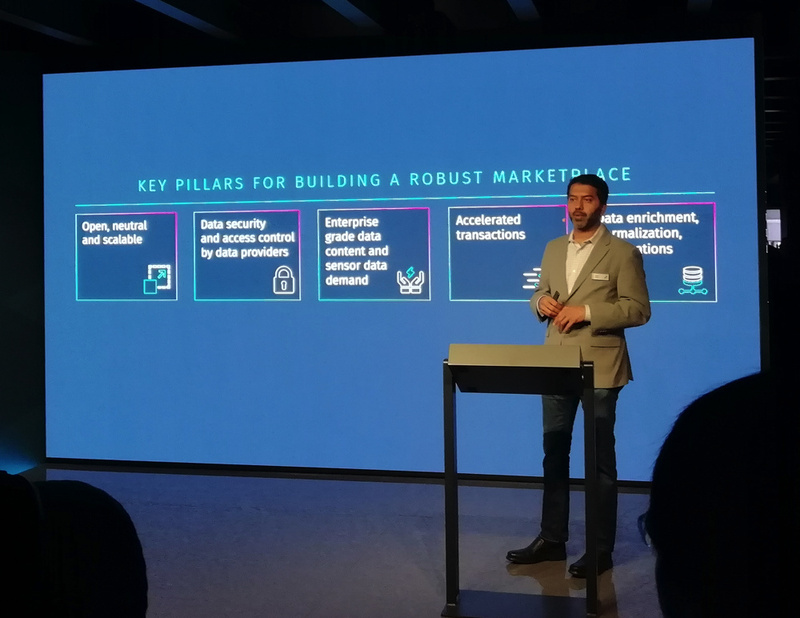 HERE Mobility, who operate almost as a “start-up” within HERE, have the most obvious “consumer” presence of HERE, and launched their new “SoMo” app, which aims to be an “honest broker” multi-mobility navigation too. 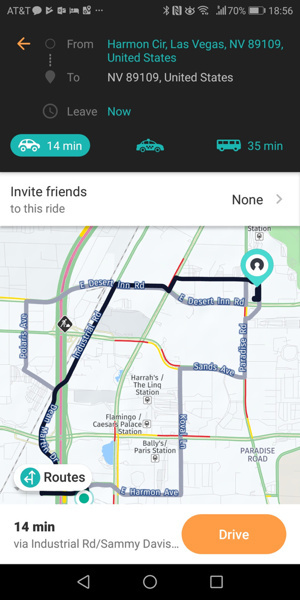 SoMo, which is short for Social Mobility, aims to offer various rideshare options from third parties, as well as transit and driving information – it’s key distinction, apart from being a platform for smaller rideshares, is to allow easy pooling of ride opportunities and friends/contacts who also need to journey to the same place. They have identified a number of scenarios where this is useful, for example, people from a particular neighbourhood who are all planning to go to a music concert in a specific venue in another part of a city. The theory being that fans of the same artist might want to travel together and pool the costs, and find a good value or available service, where the “big two” rideshares Uber and Lyft, who are not on the platform (and indeed are building their own multimodal platforms) may be not present in a particular city or don’t have the necessarily availability or good price point on the ground. SoMo will likely work best when you have a number of friends/contacts using it, and sufficient coverage of timely services in the cities where the users are. As such, it will live or die by the volumes of people using it, hence their big push to have the new app downloaded as widely as possible. One HERE announcement at CES that is of immediate to me – my Alexa Echo Dot is finally location aware, worldwide – it was frustrating that it was unable to give me directions or time estimates, while my Google Home Mini was able to – but Amazon and HERE announced a partnership where the HERE location platform (with its routing capability, traffic awareness and huge map and POI database underlying it) provides location information in response to relevant queries to Alexa. This is not through an add-on “skill” (Alexa’s terminology for apps) but is built in to the core of the device’s response framework. More map layers and location data available through HERE APIs. Thank you to HERE Technology for inviting me to CES and organising the trip and insight day. Two Lime escootershare scooters being used on the former highway in Paris beside the River Seine that is now a peaceful, traffic-free route. The scooters are passing a rather well hidden New Velib bikeshare docking station. 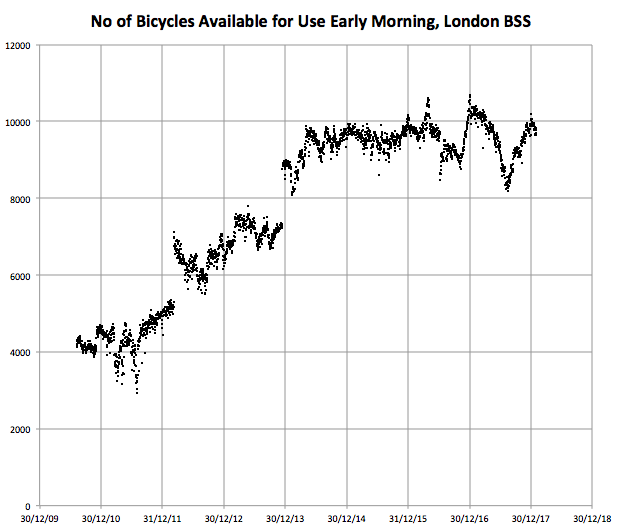 Showing the journey of a single Santander Cycles bikeshare bike over a week in July, using Kepler.gl. Journey starts/finishes are green/red and the lines become more purple as the week progresses. I enjoyed the other talks in the workshop too, especially the introduction to flowmap.gl by its creator, Ilya Boyandin of Teralytics. 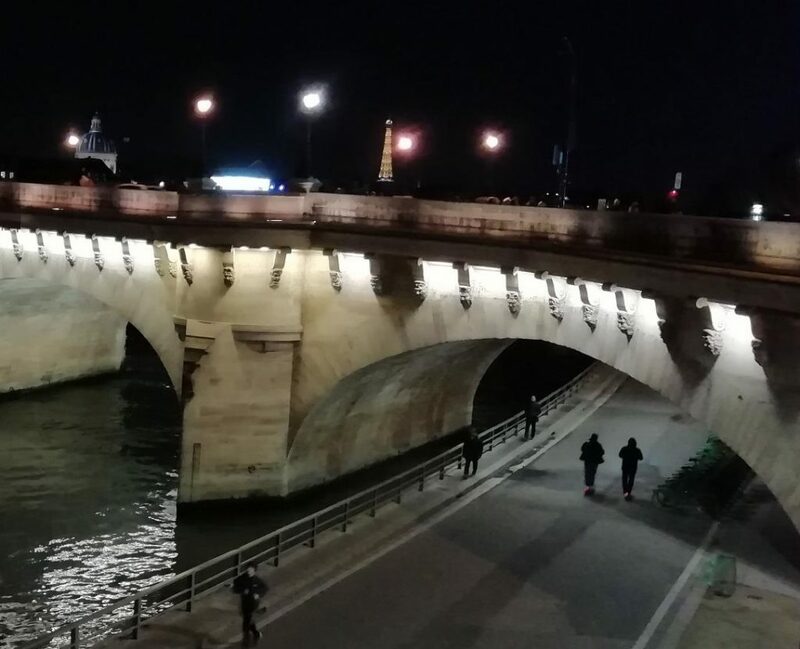 I had a few hours left after the conference to explore the centre of Paris, so I embarked on a long walk from Forum des Halles to Notre Dame, and then up to Gare du Nord. Paris has undergone a bit of a shared/smart mobility revolution on the quiet, since I last visited a couple of years back. Escootershare has taken advantage of the disastrous start to the relaunch of Velib at the beginning of 2018, and France’s more liberal traffic laws than in the UK, with numerous companies launching their operations there. 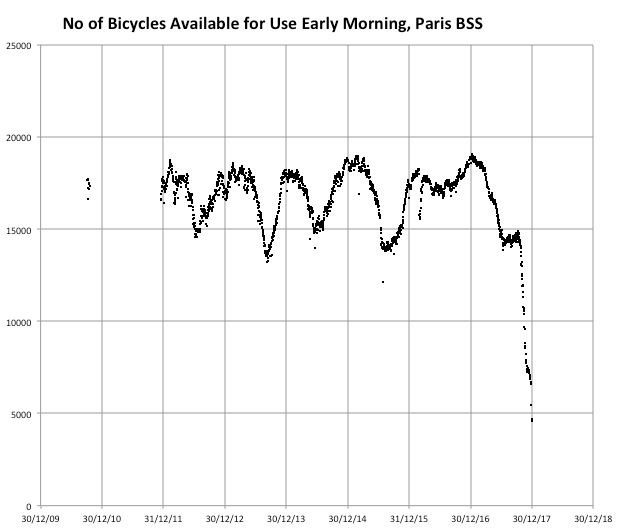 Some dockless bikeshare systems have had a go, although Ofo at least has now disappeared from Paris, and the trend for the rest doesn’t look good either. So, along my walk, I noted down all the escooter/bikeshare brands in use that I could see, along with the incumbent Velib service. There were also quite a few personally owned (or possibly white-label shares) that I spotted scooting past, which I didn’t note – for scooters at least, these were in total easily outnumbered by the brands. Escootershares are, at the moment at least, all dockless, rather than being locked in physical stations, and I believe they tend to get taken in by casual workers overnight for recharging. My walk took place between around 6pm (i.e. end of rushhour) and 8:15pm, and I saw plenty being operated even at the end of the survey interval, so I would presume that the escooters are generally collected after this time. Overall, I was impressed both by the uptake of these devices, and the care in which they were left after use. I saw no sign of any vandalism (although I did mostly stay in the more touristy parts of central Paris) and very few were inappropriately parked. I can’t say for sure that all the ones I marked as parked upright were not blocking pavements or crossing (e.g. tactile strips, dropped kerbs) in such a way that someone in a large wheelchair might have an issue, but on the whole I got the sense that they were not the pavement intrusions or litter that many of the London dockless bikeshares have become. 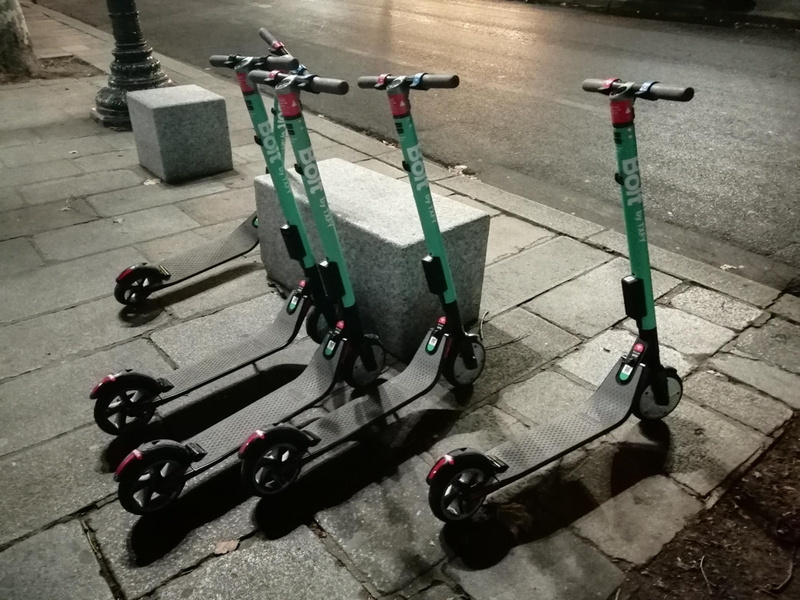 Five “Bolt” escootershare scooters – the only “group” of scooters I saw in Paris. 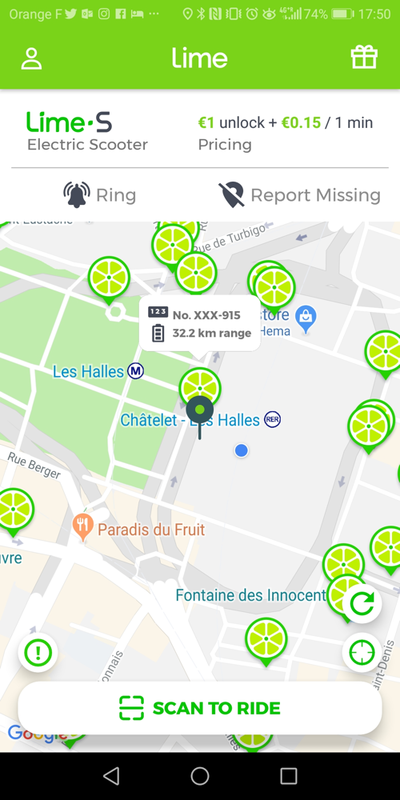 So in summary, from my unscientific survey, the dockless bikeshares are not really being used at all, the Limes and Birds are being well used, the new Velib is being used but not in the numbers I would have expected, and they are all generally being left tidily. I have no doubt that, in their current configuration/use level and street scene impact, the escootershares are a positive to the city. They are not cluttering the streets, and those that are there are being well used. 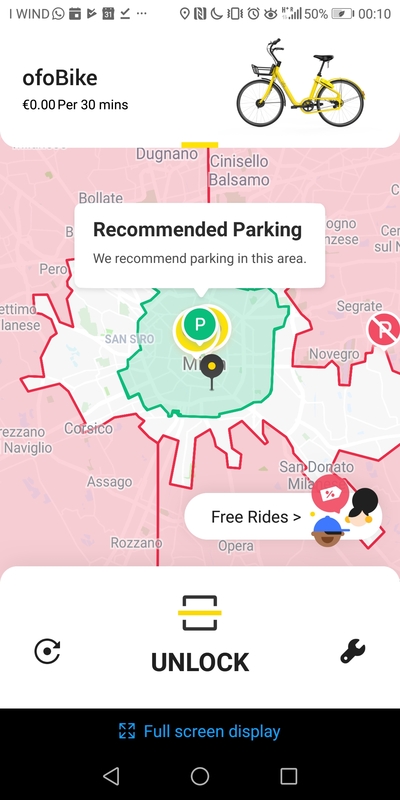 There are too many operators, for sure, so some consolidation is needed – no one wants 6 share apps on their phone, but Lime and Bird at least have a good level of usage. It is very sad to see the Mobikes lying around unused, and with so few left, but they were a bike that was, initially at least, not properly designed for the European market. You can’t take shortcuts with new mobility solutions if you want them to actually be solutions. Maybe their lower profile approach will allow them to spot the markets where they can thrive, and give them the flexibility to adapt as necessary. In London, we’ve moved on a bit from the autumn, where both Ofo and Mobike had retrenched considerably from June’s moment of “peak bikeshare”, even though we’re a long way behind Paris, thanks to escooters essentially being illegal both on pavements and public highways. Mobike has expanded a little bit again, back to Ealing, although their two operating areas in London are very small. 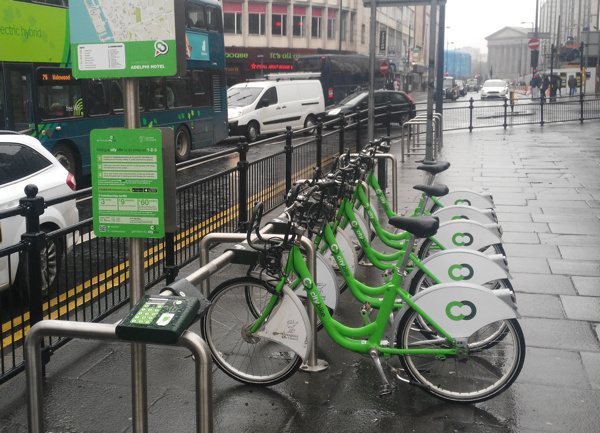 The bikes are generally now always in operator-placed groups, and while these are very visible, there are few bikes which are on their own, suggesting little use by actual genuine users. They’ve massively densified the number of bikes available in the areas, however they have attached “£20 fine for leaving bike out of zone” type stickers to all the bikes – and as these zones have changed several times since launch, I can’t blame users for not daring to use the bikes. I would not be surprised if they were seeing less than 1% of the journeys (or 10% of the j/b/d) of Santander Cycles. They also seem to struggle to monitor where their bikes actually are, or what state they are left in, as the few that are out of the operator-placed groups, are often left knocked down, for days at a time. It’s not a good look on London’s pavements, and it’s an effective way to lose the non-riding public’s sympathy unfortunately. Ofo’s operating area didn’t shrink down as far, but unlike Mobike they haven’t restocked, so there are very few bikes to be seen anywhere in central London or the other parts of the operating area. It’s almost impossible to find one for a journey, now. Both stolen Ofos and stolen Mobikes are appearing less often. This is probably because there are less available to steal, and the ones that were stolen are probably in very bad condition now. Occasionally you still see a youth on a stolen one, the bike sounding like it’s about to fall apart. 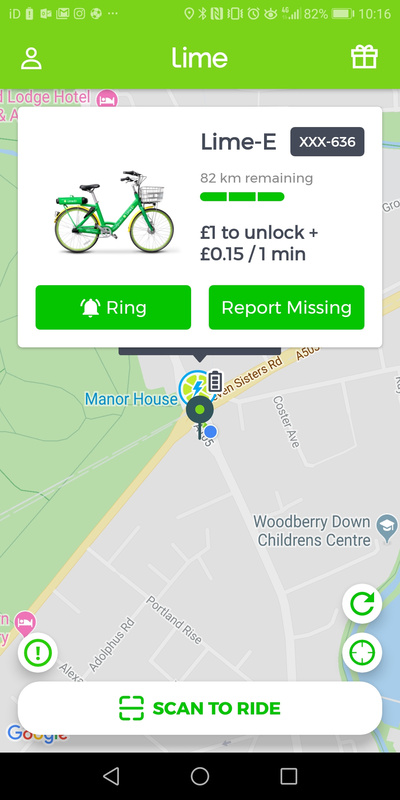 Lime has launched their ebikeshare in west London (Ealing, parts of which still have Mobike, and Brent, which was supposed to have had Mobike too but didn’t launch). You can’t officially therefore take Lime Bikes into central London. I don’t know if the motor cuts out if you do, but quite a few are appearing in central London anyway, and I think you may even be able to start from here (i.e. out-of-zone). Their starting price is very expensive though – £1 + 15p a minute. This means, after 3 minutes, it would have been cheaper taking the bus, tube or train. £1.50 flat rate for half an hour would have been better. But it’s a start, and though they are not escooters, unlike in Paris, the strength of the Paris operation suggests Lime knows something about how to run these. 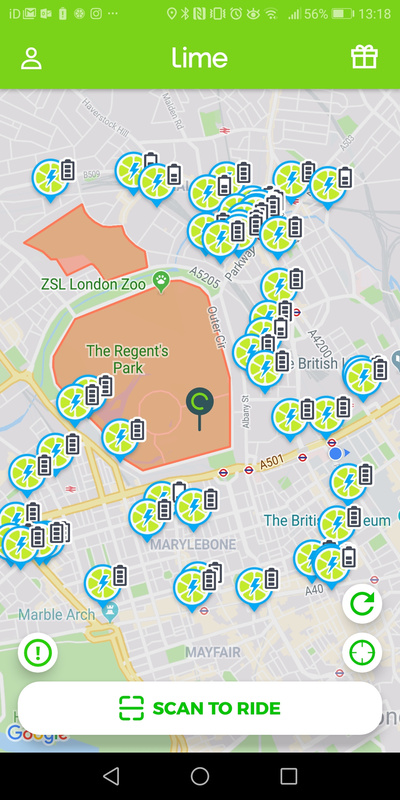 There is also an escootershare in London! Bird have launched. However, it is only available on a single route in East London, on park land that is not covered by pavement/public road restrictions. You can scoot your “Bird” between Here East, the former London 2012 Olympic media centre which is now a start-up hub that is currently very poorly connected to tubes/trains, and Stratford station, which is incredibly well connected. Again, they are very expensive – £2.50 a ride. There is a free shuttle bus between the two points, too. So, really, it’s acting as a demonstrator. But, you have to start somewhere for escootershare in the UK and this is a start. Santander Cycles are still not expanding, and unlikely to ever expand with TfL’s new financial woes and insistence on building very expensive permanent powered docking stations with card terminals, in a high density formation. But they did record five consecutive months this summer with over a million journeys each month. Their fleet seems to be in good working order and popular. I still think a redeployment of some docking stations further out, cheaper app-only stations, and an introduction of a Bike Angels style user rebalancing, would enhance things, but the system/contract is I suspect not set up to encourage radical innovations like this. I look forward to 2019 as a year in which smart mobility technologies will continue to make cities better places. Look out on this blog for some exciting news, soon. Journeys from/to a Just Eat Cycles docking station in early December, in the east of Edinburgh. Visualised in Kepler.gl. Translucency is being used to indicate multiple journeys between the same two stations. I’ve been keeping an eye on London’s population projections, and indeed have featured them in a couple of presentations recently – at a TedX event and also a CRUK data visualisation conference at The Crick. By taking the most recent mid-year population estimates for London, and the annual population change, I can simply linearly extrapolate forward to see where it hits 9 million. When I first put my presentations together, I was working off 2016 mid-year population and population change estimates. 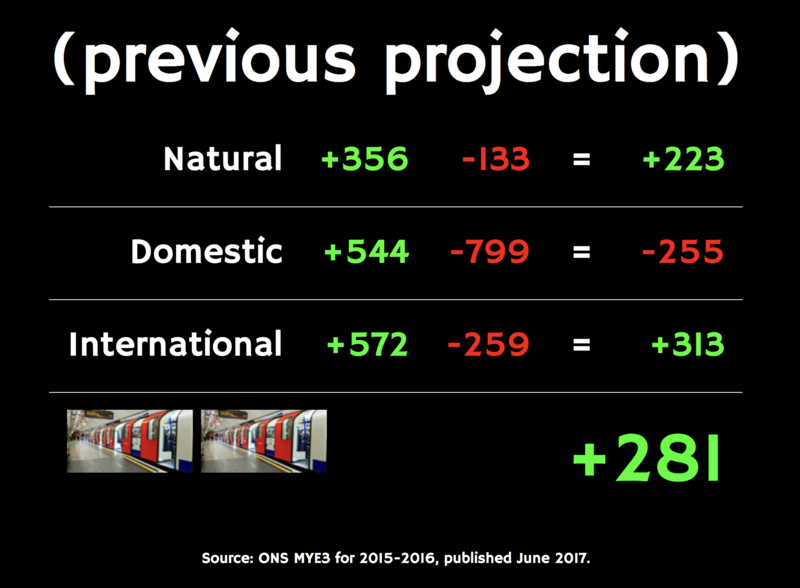 Since then, the 2017 estimates are out and have dramatically changed London’s “9 million day”. Daily numbers are a simplification – through the year, the rates vary hugely, particularly at the start of the summer holidays and autumn term, where large numbers of interns and students, respectively, move into London. The numbers do however take care of short term migration, as they only reflect those who intend to stay (or leave) for at least a year. The reasons for the change are not clear, I suspect it’s a combination of Brexit making London less attractive for international migrants, and increases in violent crime, house prices and home working, all three factors making it less attractive for internal migrants (i.e. from other parts of the UK). Or at least, after staying here for a while, people are more likely to move out than try and stick with London as a place to live and raise a family, even if it’s still a good place to commute in to work (or at least, the location of a head office to remotely dial into). London’s 9 million day was to have been the 27 October 2018, i.e. this weekend, based on the 2016 numbers and a linear projection. Now, it’s moved right back to 25 September 2020. I am sure that a linear projection is an oversimplification, there is clearly a slowdown, and I am sure that the impact of Brexit (i.e. spring 2019 onwards) may further hasten the slowdown – so we will be well into 2021 I suspect before the number is finally hit. 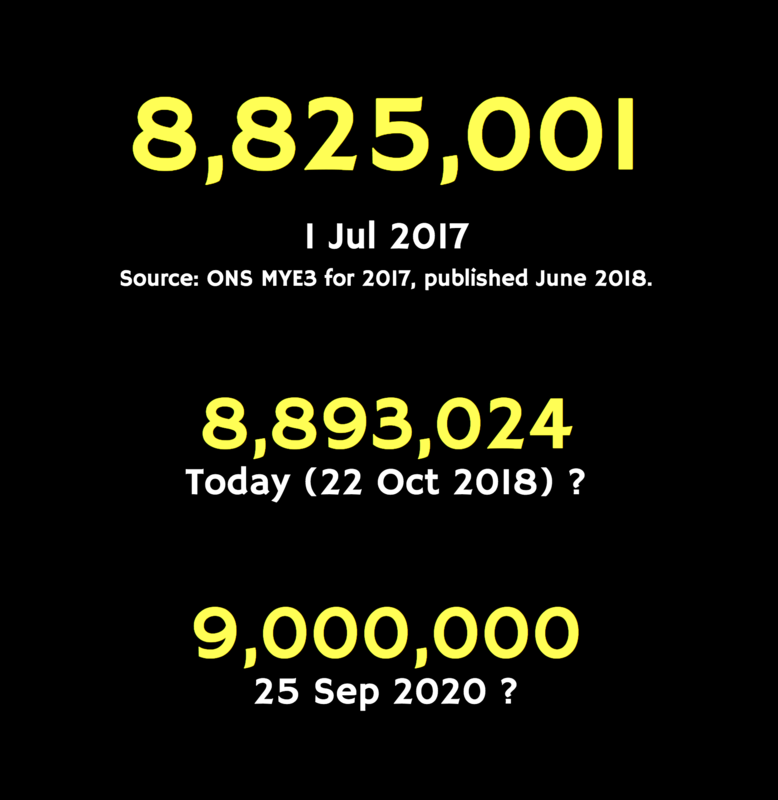 ONS publish their mid-year estimates a year after the date of the estimate, so we can expect to see the mid-2018 estimates and changes, in the middle of next year, at which point I will recalculate the 9 million day again. 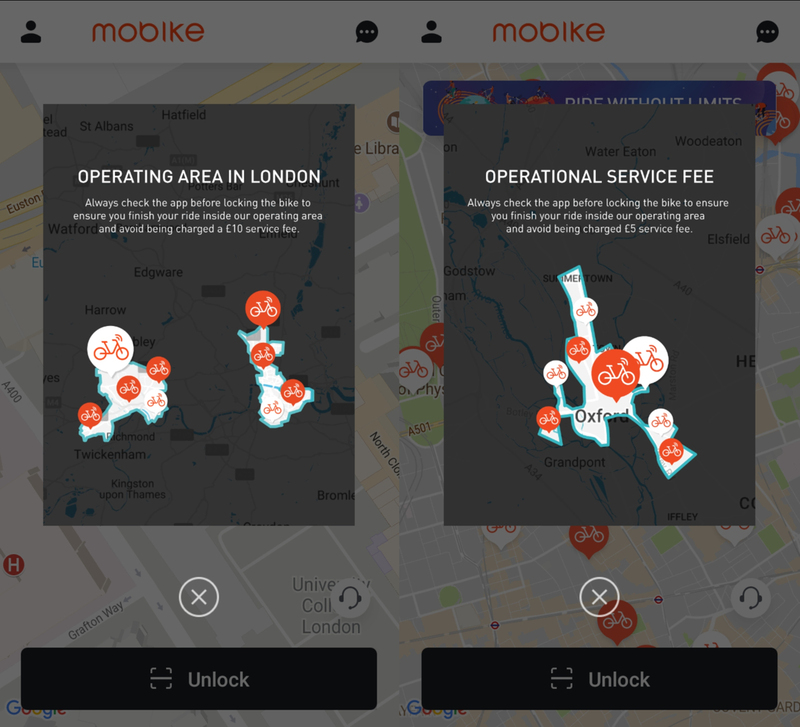 I recently presented at the CoMoUK Good Mobility Conference in East London, looking at the story of bikeshare in London over the last 12 months ago, touching a little on other systems in the UK. While the core of the presentation was a timeline, numbers and data from London’s bikeshare between last summer and this summer, I took the opportunity to also rate the various UK offerings on their open data provision, and offer some of my thoughts on round 2* of dockless bikeshare which took place this year. It was great to hear a wide range of presentations at the conference. I particularly liked the Derby presentation. Thanks also to Tim, operator of Derby, for sorting out the GBFS feed. Thank you to CoMoUK for inviting me. * Round 1 being oBike’s “forgiveness” model back in summer 2017, and round 3 being, I’m sure, American dockless providers “getting it right” next summer. Having travelled to both Milan and Singapore in the last few weeks, it’s worth a note on the bikeshare provisions there. 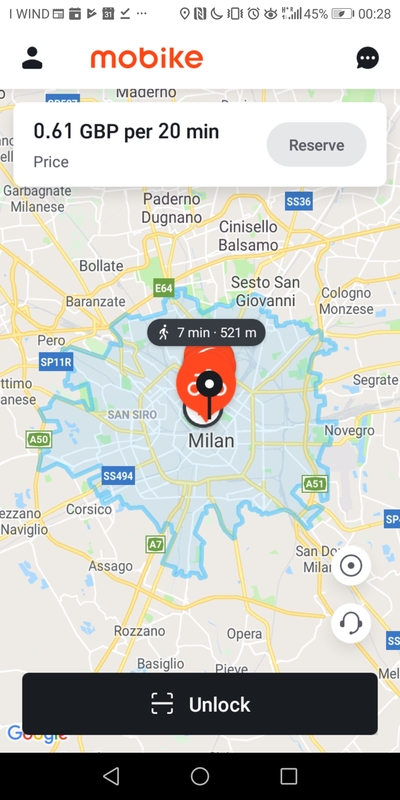 Milan has BikeMi, a long-serving dock-based bikeshare system, which is one of the nearly 400 city systems that I have mapped in Bike Share map. It covers a big part of the city. 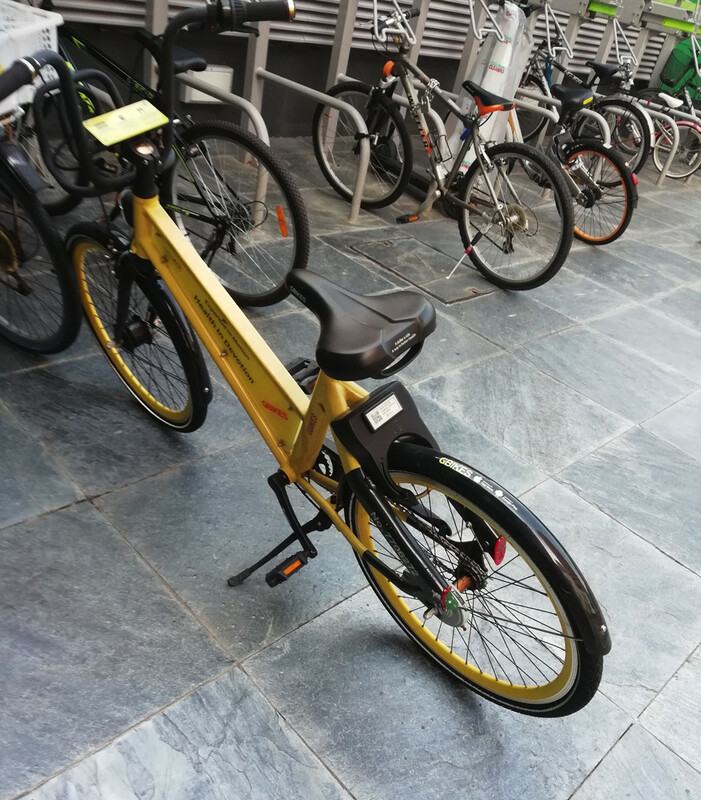 There was a docking station close to both my hotel and to the location of the the conference I was attending, however far more noticeable were the numbers of Mobikes around the streets. Ofo also operates in Milan, although their bikes are not as prevalent. 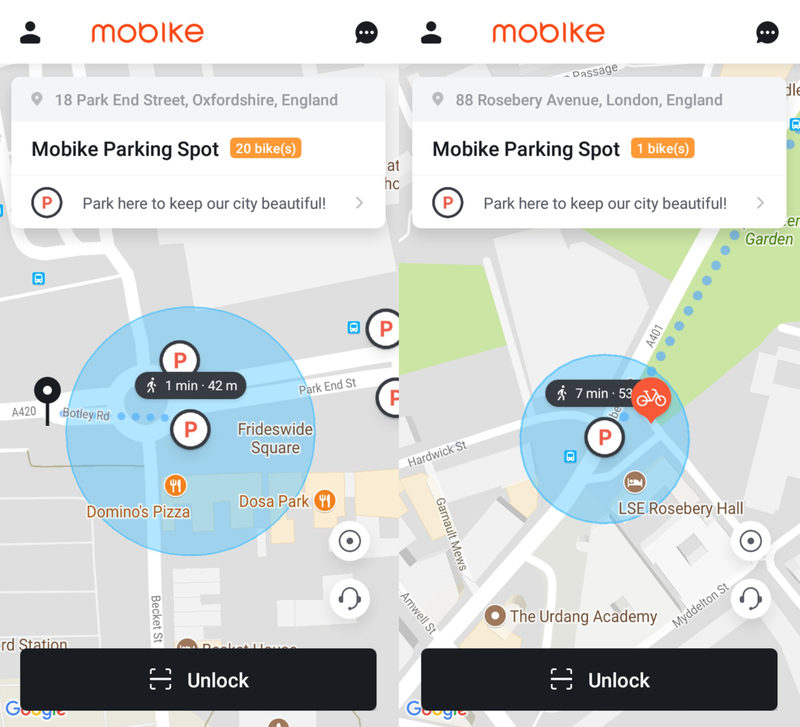 I ended up using Mobike – mainly because I already had the app installed on my smartphone, for my occasional usage in London – and Mobike, like Uber, works nearly seamlessly across the various cities it operates in. 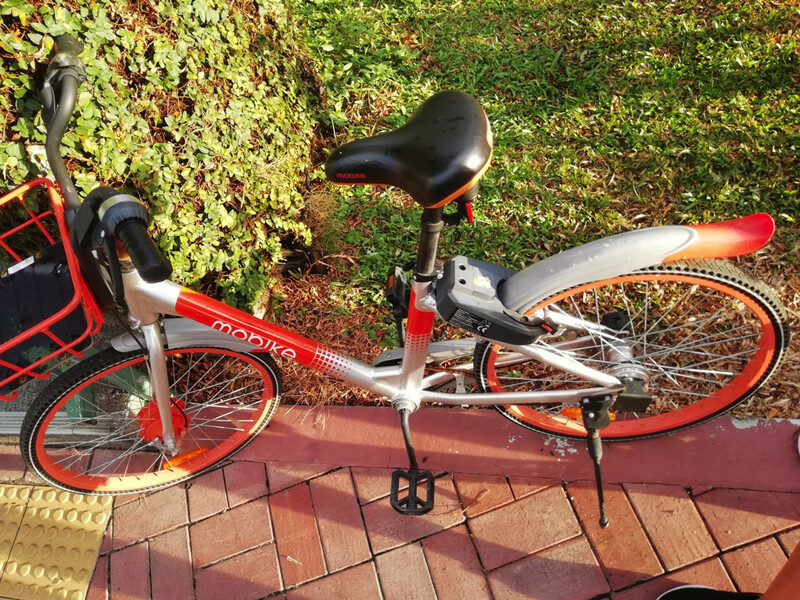 This simplicity, combined with the new EU free roaming laws meaning that I can use the app without incurring roaming data charges, and the fact there was one to hire just around the corner, means that Mobike for me won over BikeMi. It’s a problem that dock-based systems are going to struggle with, unless they can somehow collaborate with each other globally. Perhaps a start would be JCDecaux “Cyclocity” systems allowing use across their cities if you are already signed up for another one, and a similar approach for Motivate and Nextbike systems. Although, as each city typically has a monopoly dock-based operator, this approach still has a more limited approach. (I say nearly seamlessly – both apps struggle a little initially when moving to a new city. 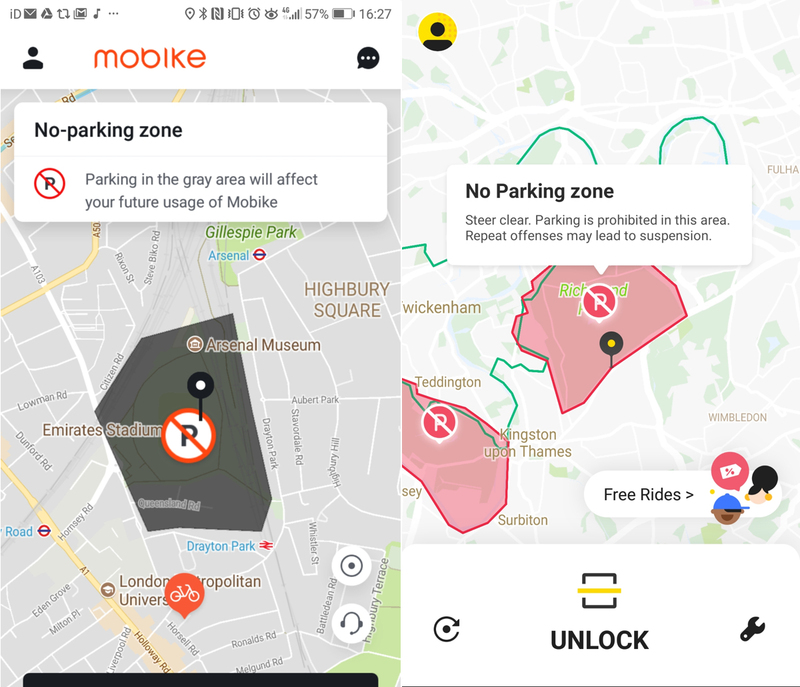 In Mobike’s case, the system boundaries generally don’t appear until the app has been restarted a number of times, after moving to a new city. For Ofo, the pricing indication is initially wrong – I’m pretty sure it’s not free! Mobike and Ofo have not suffered in Milan like their have in London. They both operate throughout the historic centre of the city, and much of the suburbs, rather than being artificially constrained on a borough-by-borough basis like in London, or only operating in small sections of the city by operator choice/resource limitations, like in Oxford and Cambridge. 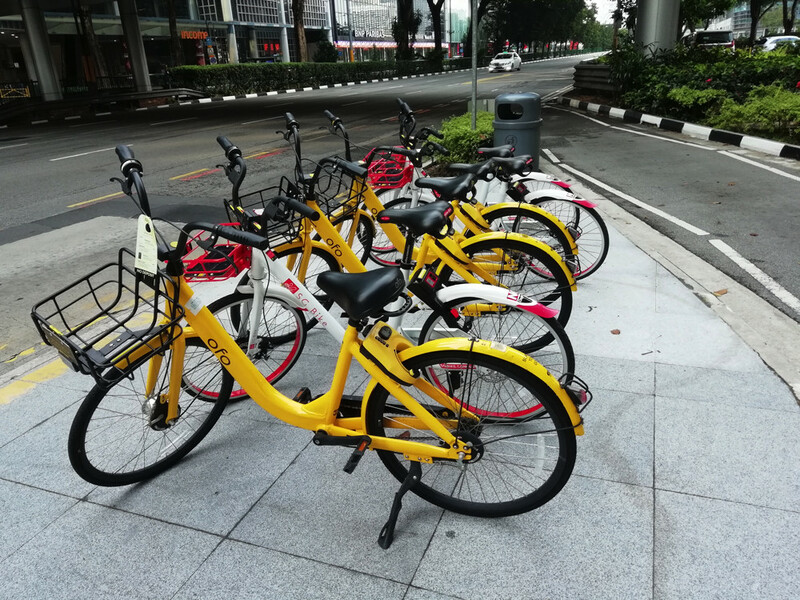 In Singapore, there is no dock-based system but a wide variety of dockless operators have bikes here – as well as Ofo and Mobike, there are the home-grown SGBike and GBikes (the latter based on the SharingOS system), and OBike (cobranded GrabCycle) – which started out in Singapore. 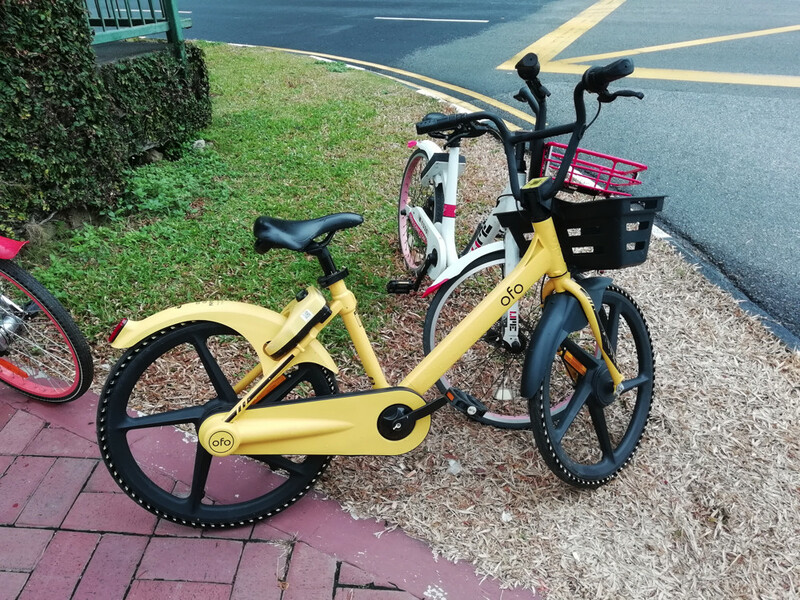 Both GBikes and OBike have ceased in Singapore, presumably their apps no longer unlock their bikes – but they are both scattered everywhere – or rather, this being Singapore, they are neatly stacked up against trees and fences. Will anyone remove the bikes for companies that have ceased to be? Singaporians being extremely considerate people, I didn’t notice any bikes blocking pavements, or indeed showing any sign of lock tampering or vandalism. A small number of bikes had damaged wheels. Again, I have both the Ofo and Mobike app on my smartphone, but with no free data, and no particular need to cycle, I didn’t hire any bikes this time. The central part of the city, at least, is not as bikeable (or walkable) as Milan – with large roads and the lack of much in the way of dedicated cycle lanes, the only cyclists generally seen were on riverside paths and in parks. Pedestrians also can come to junctions without any crossings – except perhaps by a nearby overpass. It’s all very well having a marked parking bay, but if it’s beside a huge road with no cycle lane, is anyone going to use it? The high temperature (30°C) and humidity, characteristic of the city state throughout the year, doesn’t make it the greatest place for comfortable or leisure cycling. I saw almost no-one using the dockless bikeshare bikes, even through are are loads waiting to be used, but I did see plenty of people on eScooters – both for-hire ones and private ones. It is only a matter of time before these become huge in London. I did notice a number of interesting varients of both Mobikes and Ofos. They have been in the city longer than they have been in the UK, and so a greater number of models are on the streets – but as well as older versions, there are newer ones that have not made it yet to Europe. These newer ones generally look chunkier, with bigger locks. Notice also the SGBike and Mobike parked neatly beside by other users. Off the pavement, off the road, not knocked down. London, you have a lot to learn. I did get the feeling that bikeshare might be a spent force in at least the central part of Singapore (I did not visit the suburbs) and eScooters may already have taken their place here. Coupled with Singapore not being a particularly cycling friendly city – certainly compared to London – I wonder if the only thing remaining is for the city council to sweep up the unused bikes for the bust operators, and tell the others ones it’s time to move on? 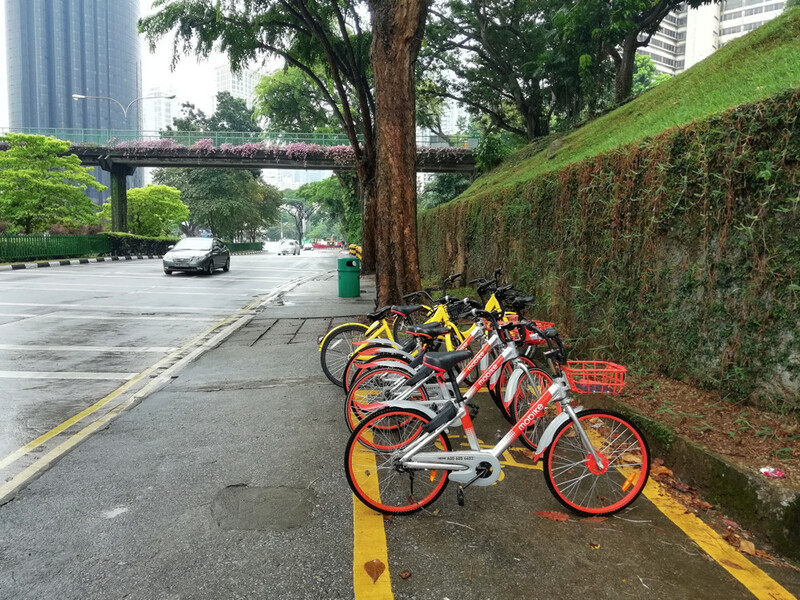 I understand that the council has recently tightened up the regulations for bikeshare in the city, making it harder for the companies to operate, but a necessity in a city with the layout and streetscape like Singapore’s. It isn’t clear whether you can continue to start journeys from outwith the operating area, but you must finish within them to avoid the fee. However, you can also get the fee waived by taking any Mobike from outside the operating area, back inside it, within 12 hours. It could be the bike you took outside, or another one. This is interesting – let the user help the system work better. You either fix the problem (bikes outside areas the operator can manage effectively, or don’t have permission to be in) or pay the operator to do it for you. 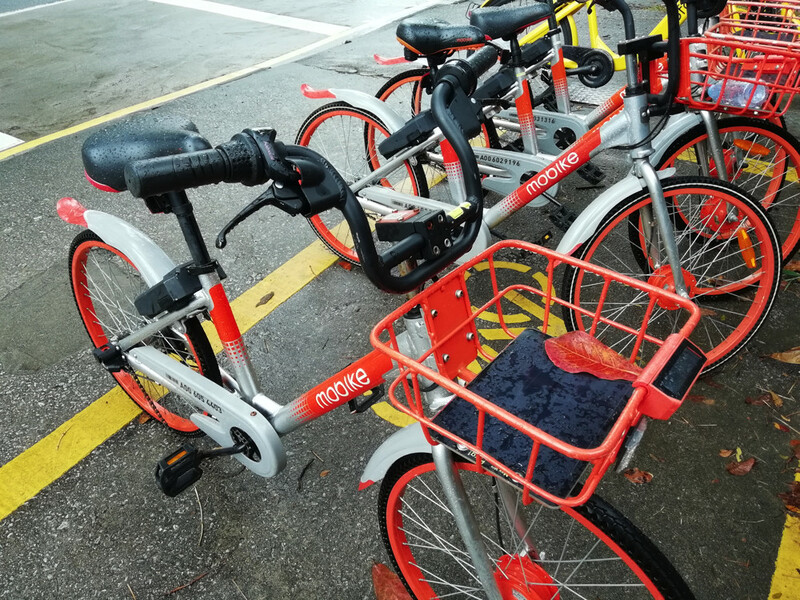 Mobike is making a bigger deal of its hubs now, showing the numbers of bikes currently available at them. Bikes in a circular buffer around each hub are reported as at the point in some cities (Oxford – left) but individually in others (London – right). 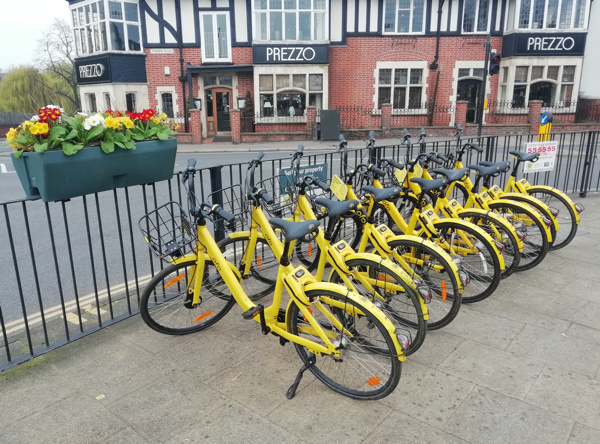 This makes them a little more like a hybrid system, with certain locations generally having a reliable pool of bikes available, but with out-of-hub parking still available to keep the system flexible. At this point, there is no user incentive for hub-based journey finishes or starts. Mobike have also shrunk their operating areas – in Islington, it now doesn’t extend north of Holloway. Presumably Mobike are tired of moving their bikes back up the hill to Archway and Highgate, only to have everyone cycle them back down. However they have extended into a small part of Hackney – the De Beauvoir Town area. 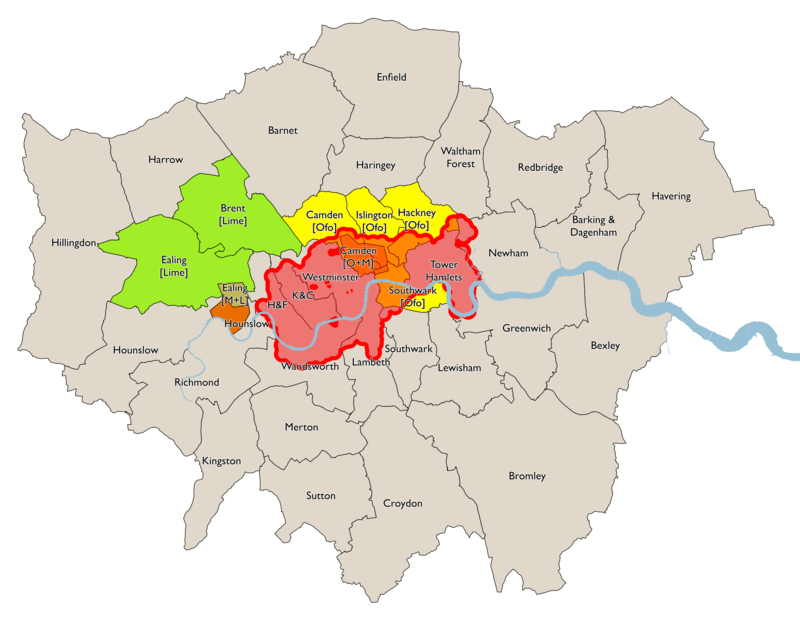 They have also shrunk their Southwark footprint, so that the bikes can only be used north of the South Circular, and their western footprint has also shrunk – no service in west Hounslow, Feltham, Southall or Greenford now. They has also completely pulled out of Newham. 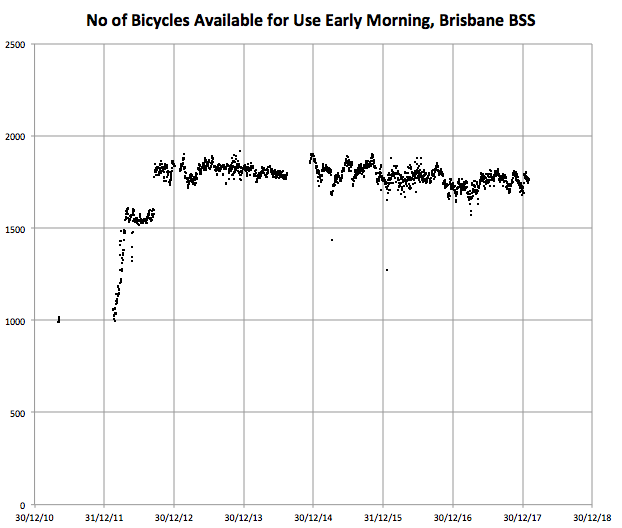 Looking at their app, it never looked like there were many bikes available for use there anyway. You can see the area of operation here (orange border). Ofo and Mobike are also now showing specific forbidden areas on their app. This is interesting, because I assumed that all areas outside of their operating area were forbidden. Presumably these are extra-problematic areas for the operators. 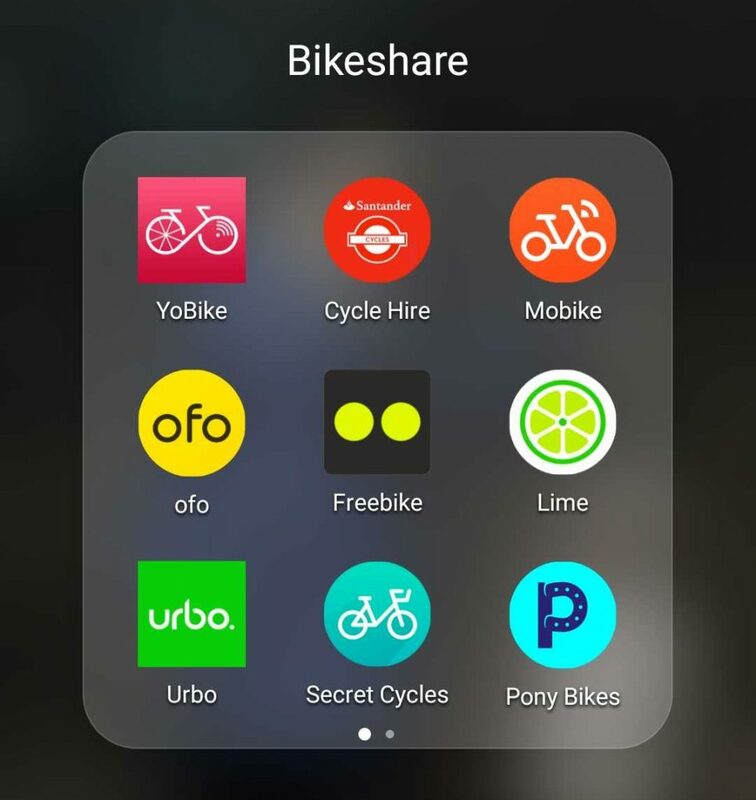 Ofo has marked various royal parks as forbidden areas, while Mobike has marked canal-sides, the London Bridge station complex, and large public parks, as forbidden. 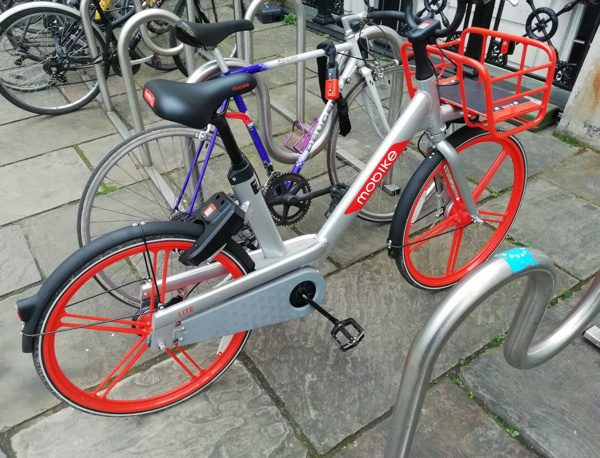 Mobike’s out-of-operating-area areas allow journeys to finish but the user (only) is then encouraged to move the bike back into an operating area within 12 hours, it is locked out of use for others. Shown in app as points overlaid on green-bordered rectangles. Parking here encouraged, occasionally incentivised with free next ride coupons. Shown as points, but a blue circular buffer is shown on clicking it. Parking here encouraged but not incentivised. Shown as regular map. Parking locks bike for user-only redistribution back. Shown as regular map. Parking results in fine, unless it (or another) is taken back in in 12 hours by the user, but still available for use. Shown as red shaded/bordered areas. Parking may result in credit drop or penalty. Shown as grey shaded/bordered areas. Parking may result in credit drop or penalty. Meanwhile, the third dockless player in London, Urbo, has announced it is quitting the three London boroughs it is operating in – Enfield, Waltham Forest and Redbridge. Enfield will announce a replacement “soon”, Waltham Forest is getting Ofo in instead, and Redbridge already has Ofo. The numbers don’t sound great – only 6000 journeys in Waltham Forest in 5 months, on a fleet of 250 – so 20 journeys a day, or 0.16 journeys/bike/day, and 3000 miles clocked up in Enfield, again in 5 months, on a fleet of 100 – so (assuming average journey of 1 mile) 0.2 journeys/bike/day. This means these bikes are spending 99.8% of their time not being used (assuming an average journey of 15 minutes). Barnet had just announced that Urbo was coming there, and Barking & Dagenham was due to sign-off Urbo coming there in July – I would speculate that these launches may be off. Urbo, an Irish company from the start, has just been bought by the operator of several bikeshare systems in towns in Ireland, and it has just launched Dublin, where it has access to the whole of the city. Just like in London, Dubliners likely want to cycle throughout the urban area and not within arbitrary political boundaries. So that would likely be where the London Urbo bikes are going. 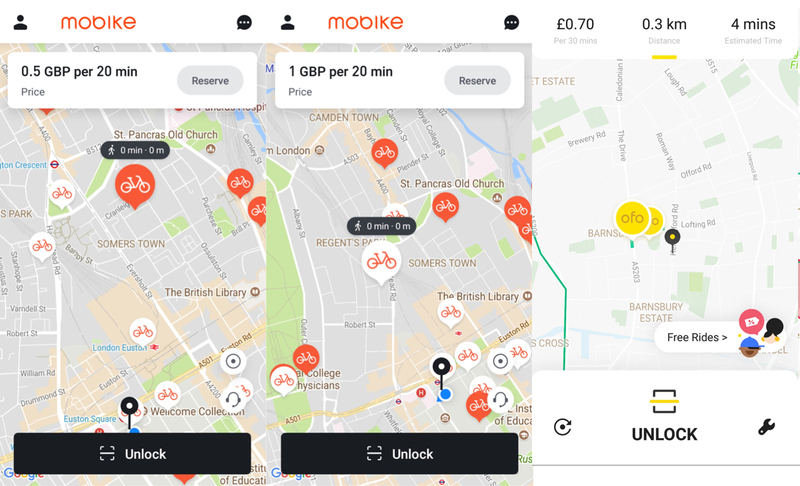 In better news, both Ofo and Mobike are both continuing to expand in London this summer, in areas where they do think dockless bikeshare will work. Mobike should be coming to Haringey soon, while Ofo have today announced their forthcoming expansions – Camden launches this week, with Waltham Forest following shortly (this week, says the borough at least), followed by Wandsworth and Hammersmith & Fulham. This means yellow bikes will soon be appearing in Bloomsbury, Fizrovia, Camden Town, Kentish Town, Highgate, Belsize Park, West Hampstead, Walthamstow, Chingford, Leyton, White City, Hammersmith, Fulham, Putney, Wandsworth, Battersea, Balham, west Clapham and Earlsfield. My research lab, the Consumer Data Research Centre, is making available much of the docking station empty/full observation data that I have been collecting, at frequent intervals (up to every 2 minutes) for generally the last 5 to 8 years, for over 50 cities around the world, to facilitate and encourage further quantitative research in the field. I already get numerous requests for this data – it is very interesting for all kinds of research projects, particularly because of it spans multiple years, so introducing this new mechanism is a good way to manage these requests. You can see the cities listed at the CDRC Data product page. For three cities (Cork, Limerick and Galway in Ireland) we have directly attached the data to the record page. It is the data that has been collected up to the point that the record was published a few days ago, and on request we will reload the data, capturing more recent observations. For the other cities, the data record is “Safeguarded”. This is because the logistics and technical limitations of attaching the very large amount of data to the records. Namely, it takes quite a lot of time to prepare each dataset for download, and the platform we are using is not designed for hosting extremely large files – plus, it is likely that researchers would want the most up-to-date data, meaning that we would need to build a mechanism to update the record regularly. Using an application process also minimises spurious requests – we have invested time both in collecting the data and processing it, so we need to be confident that it will be used. Additionally, some systems (particularly those in the USA) come with their own data licence restrictions from the operating companies meaning that we cannot freely distribute the “raw” data. In Europe, most of the datasets are explicitly open, meaning use of the data is unrestricted (although normally requiring attribution). the Irish cities listed above have a slightly more restrictive licence, requiring us to distribute it on the same terms, which we have done. The data is available on application to interested institutional researchers. In practice, this means academic, public sector and non-profit organisations who which to carry out public/publishable research with the data. Application details are attached to each record. Above and below are simple graphs produced from the data for various cities. 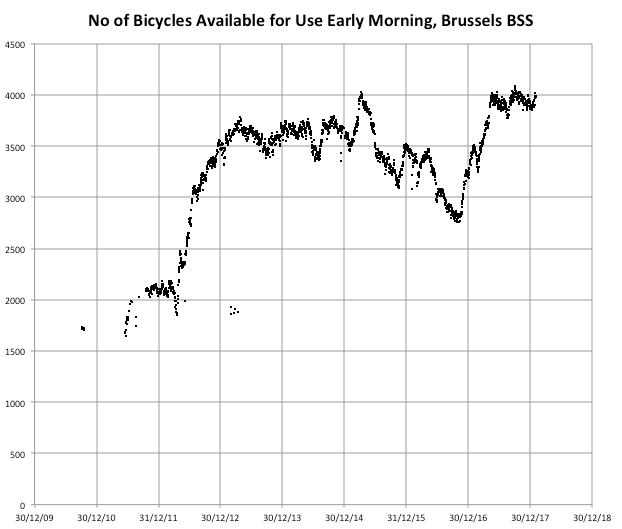 I have looked at the number of bikes available every day at around midnight and plotted it on a simple graph against time. 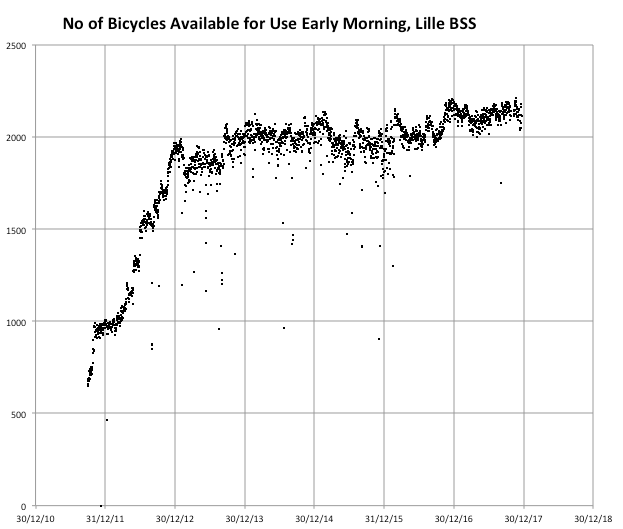 Stay tuned because I am planning on releasing two further “data portals” of bikeshare data, soon. These are slightly more manageable in terms of file size and administration, so I am aiming for these to be directly downloadable.